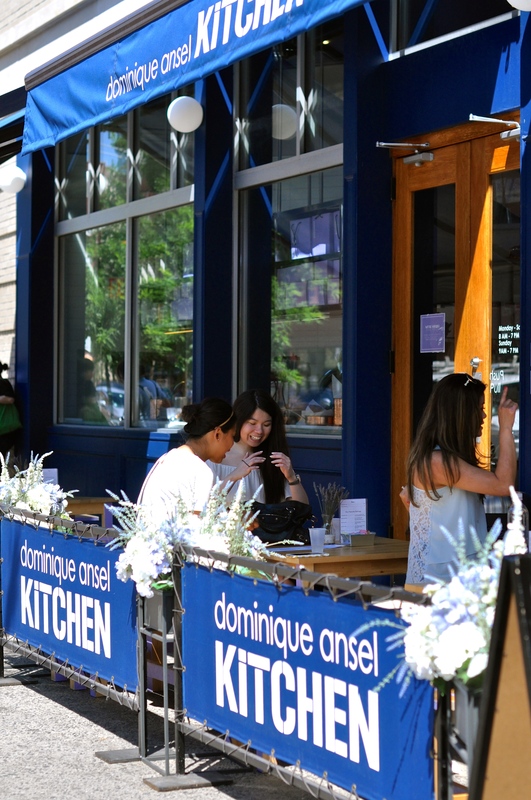 Perhaps best known as the Cronut Guy, Dominique Ansel is tremendously well diversified in his culinary talents, from pastry (including laminated doughs, short crusts, puff, and choux pastries), cakes, yeasted breads, savory sandwiches and salads, and egg dishes, to frozen desserts. You only have to take a look at the menu at his DA Bakery or DA Kitchen to appreciate his range. 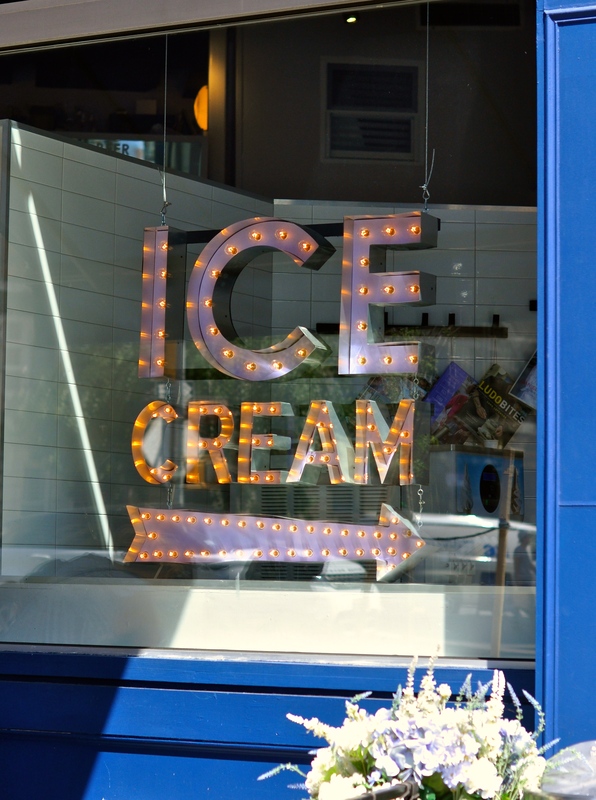 Now, with summer time here, he has introduced a selection of serve ice cream, homemade of course, at his West Village Dominique Ansel Kitchen location. On a recent trip to NY last week, I stopped by with friends for a cold treat. 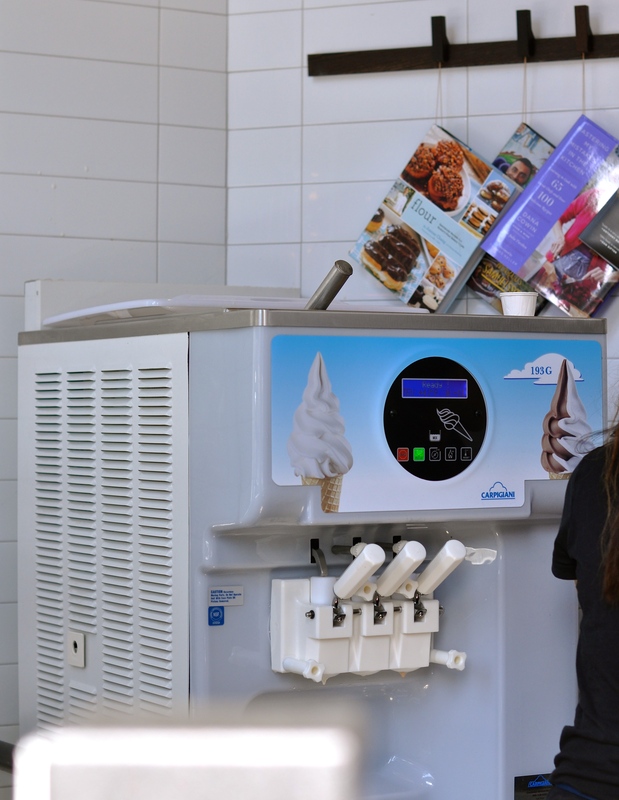 As with any of his creations, this soft serve is his unique interpretation and execution of a classic–and always keeping us on our toes by adding a modern twist. 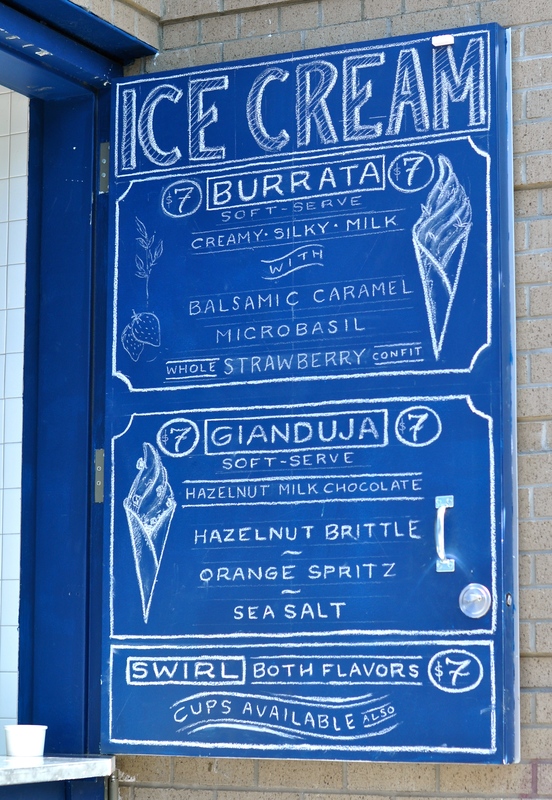 These are Ansel’s versions of plain vanilla and chocolate: a Burrata cheese soft serve with balsamic caramel, whole strawberry confit, and microbasil, and the latter, Gianduja soft serve with hazelnut brittle, orange spritz, and sea salt. Even for purists like myself, I was converted. Priced at $7 each, the portions are large and shareable, if you so choose (if you can be convinced to after that first taste). 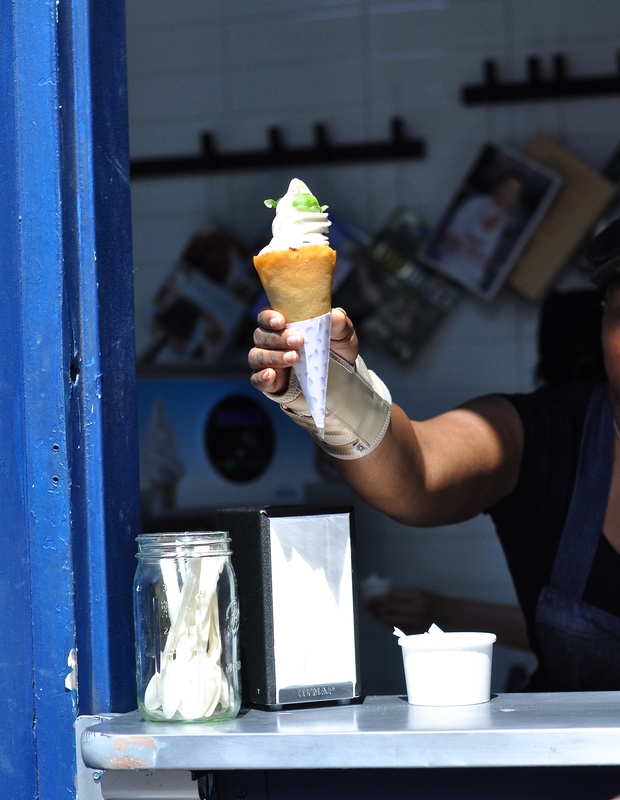 The ice cream is served in a homemade cookie cone, or alternatively, in a cup. Orders are taken only from the takeaway window outside of DAK–none are taken inside. A nice break from plain old vanilla, the Burrata soft serve tasted mild and milky to start, with a slight tangy and buttery finish, like the fresh cheese itself. The texture was fine and smooth, like eating whole milk. 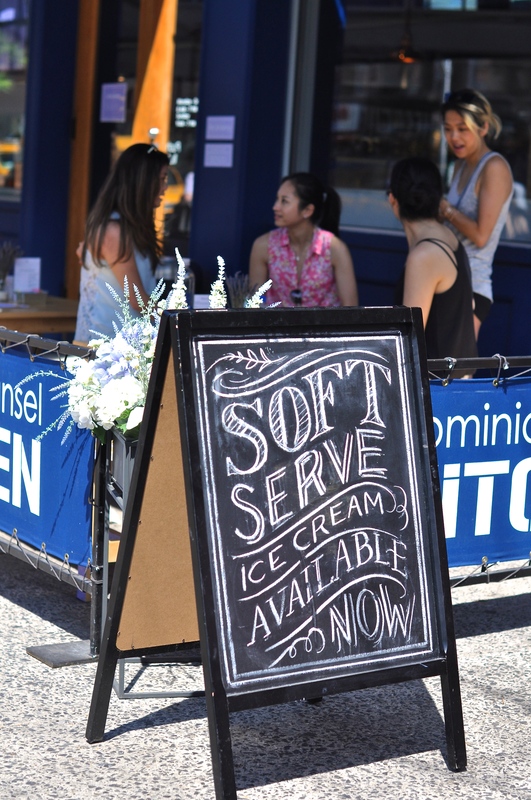 No wonder, since Ansel’s soft serve is made from real milk, rather than from a powdered mix. 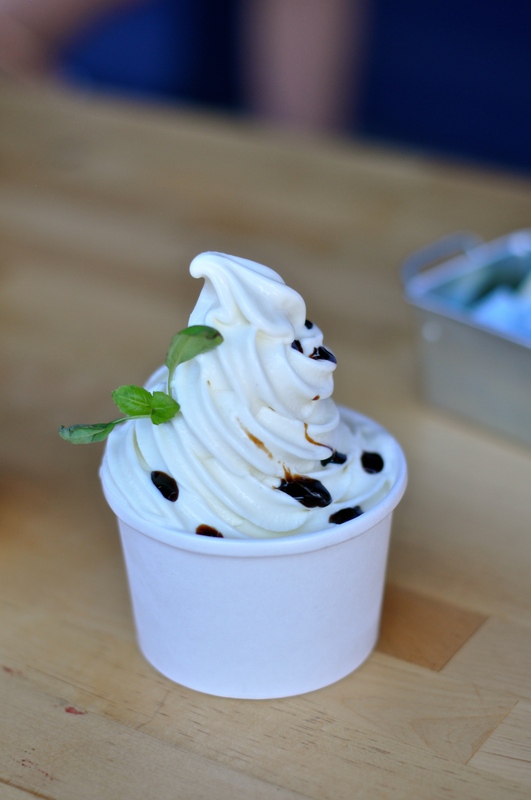 The “toppings,” if you can call them that, were sparingly given–a micro “micro basil” sprig, and several drops of balsamic caramel dotted the ice cream, like a polished plating at a fine dining establishment. And where was the strawberry confit? After giving up on it, we finally hit gold at the bottom of the cup, where the macerated strawberry was buried away. In theory, these additions sound intriguing, but in practice, they did not add anything interesting or complementary to the already remarkable Burrata flavor. The Gianduja, on the other hand, had bigger, bolder flavors of hazelnut with a hint of cocoa. 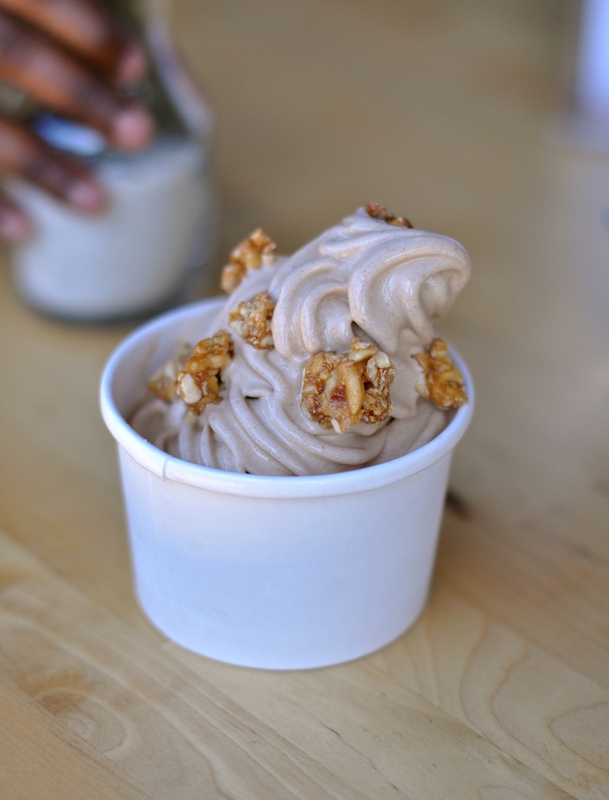 The hazelnut brittle added a nice crunchy texture, contrasting the smoothness of the ice cream. However, the orange spritz and sea salt were again, added with such a light touch, that whatever flavors they were intended to impart were masked by the boldness of the hazelnut. Although neither the Burrata nor the Gianduja was all that refreshing on a hot, humid, NY summer afternoon, the flavors themselves are without doubt, unique and the texture addictive. The Burrata was the clear star of the two flavors, and warrants a nod of appreciation for trying to be different and clearly, a successful take on and execution of the real thing.